Home » Service Manual Catalog » EPSON Service Manuals » InkJet Printers » SM_T11 I have paid for Reset Key but not received yet. Epson T10, T11, ME30 Printers Service Manual New! 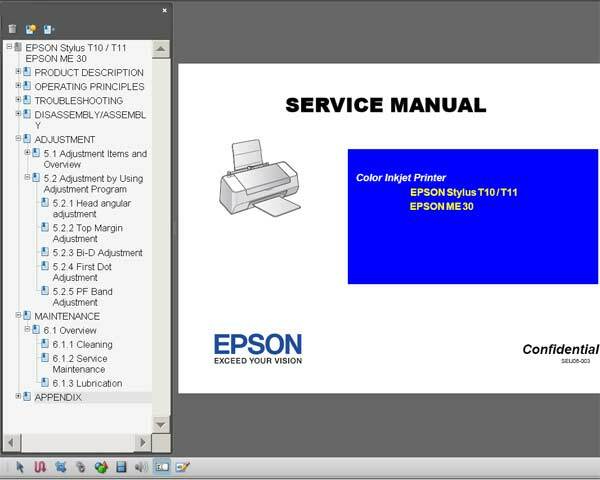 This Epson T10, T11, ME30 service manual describes basic functions, theory of electrical and mechanical operations, maintenance and repair procedures of Epson Stylus T11. The instructions and procedures included herein are intended for the experienced repair technicians, and attention should be given to the precautions on the preceding page. I want to know this program before i buy it. Can you explain me about your program i had many proble.. Notify me of updates to Epson T10, T11, ME30 Printers Service Manual New!